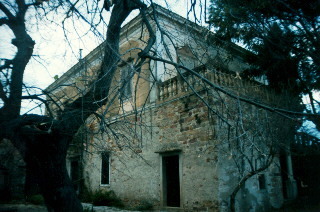 The "Tetteriko" Estate, property of A.Tetteris’ heirs is the largest estate in Kambos. The 10 acre property contains the main building (mansion), two auxiliary buildings and a pebble-paved yard surrounded by a reservoir, well and fountain. The 1881 earthquake destroyed the mansion, however, it was rebuilt soon thereafter, exhibiting patterns of the neoclassical architectural style which is also found in other estates in Kambos. The Ministerial Decree of 1990 characterized the buildings, reservoir, well, fountain, pebble-paved yard, and Antoine Tetteris’ orchard in addition to the wall surrounding the estate as preserved, historical monuments.